In a large bowl, combine butter, egg, milk, apple and zucchini. In a separate bowl, sift together flour, baking powder, cinnamon and sugar. Stir dry ingredients into apple mixture, just until combined. Heat a lightly oiled griddle or frying pan over medium high heat. 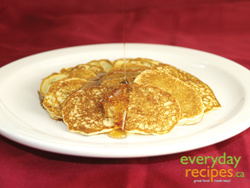 Pour by the spoonful to make toonie-sized pancakes. Brown on both sides and serve hot. Yields 4 servings.